On one of the automated reports the disembodied voice said they’d found our problem and a crew was working on it. Obviously not. I have a bone to pick with United Illuminating. I understand they are pressed to the breaking point with the remnants of Saturday’s storm. I take them at their word that crews are working as hard as they can. My upset has to do with bad information. Saturday night UI’s automated trouble line told me I’d have power early Sunday morning. When Sunday morning passed I was told Sunday afternoon. Later I was told we’d have lights (and water and heat) before 3:00 AM this morning. I’m typing this Monday at 3:28 PM and we’re still without power. Again, this isn’t about the speed of United Illuminating’s repair. However, if at any time along the way they would have given me a correct estimate of power resumption I would have attempted to get us to a hotel. I didn’t because I thought we’d have power shortly. Hamden still has nearly 2,500 homes and businesses without power. Right now there is one customer more without power than an hour ago! Helaine is sitting at home (where it’s 50&#176) in a coat, under a blanket. She’s got a radio on tuned to WTIC-AM&#185 (Kudos to them for superior coverage). She is sad. Me too. Yesterday a UI spokesman said everyone would be online by this evening. I’m wondering about that prediction too. &#185 – WTIC-AM and WTIC-TV aren’t related. It’s a very unusual situation where we have the same call letters, but aren’t the same company. Yup. Went through the same thing with Irene…except it was for seven days. Hoping you are restored soon. The cold makes it much worse. Six days with Irene. CL&P told us Thursday and then, without explanation, changed it to Tuesday. In fact, we got it back on Friday. Same thing with CL&P, Geoff. They either have NO information or inaccurate information during outages. Very hard to decide what one should do about accomodations etc., etc. Even the CL&P outage maps (interactive and supposedly updated every 15 minutes) are wrong. This morning the map indicated Bethlehem was 100% without power. I have a FB friend who told me she never lost her electricity during/since Alfred and that their map is wrong A LOT! 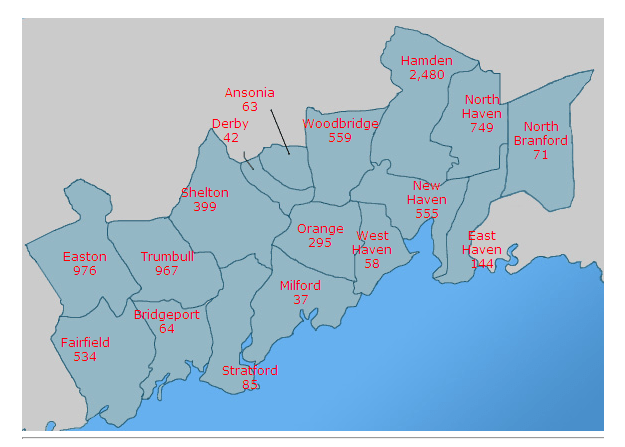 Connecticut’s power companies do not seem at all capable of giving correct, up to date information to their customers (or should I say ‘rate-payers’). In this technological age of instant communication this seems inexusable! Forgot to include the FB friend I referred to is a resident of Bethlehem. Invest $600 when you can find a generator. Ours is running our refrigerator, freezer, furnace minmal lights and TV. Not ideal but much better than the alternative. The truth may hurt but if they are honest with their predictions then people can make the proper accomodations. They probably just say what the people want to hear without realizing how much they are gonna piss people off with broken promises. Good Luck to you geoff. Hopefully you have power soon. Although I’ve yet to see a single CL&P truck or crew I’ve seen power restored in several areas so they must be working. I was driving Route 44 in Avon last night when everything lit up. I pointed to a working traffic signal and asked my passenger “What’s that? !” I then called my home in the southern part of the state to find my answering machine was working. Today’s job is doing laundry and setting clocks while I wait for the cable to come back on. Hoping everyone else out there also gets power back soon! Excellent post, Geoff. UI first said power would be back for our area by 7:30 pm Sunday, then midnight Monday night, now they say midnight Tuesday night. Still no power. They broke a cardinal rule of how to handle a crisis like this by giving out false info and have seriously damaged their credibility. Also it seemed pretty likely that these deadlines could not be met at the time, given the outage status reports and the visible extent of the damage. Apparently the folks at UI who make and issue these predictions are only loosely connected to the reality on the ground. UI now claims the delays beyond their original predictions are because the number of incidents and outage reports went up yesterday. So at the very time that UI was saying it would be soon able to send crews to help CL&P customers, the company didn’t even have a grasp of the extent of damage within its own service territory?? That should be pretty worrisome to UI customers. The communications we received while powerless for 7 days after Irene were not much better. But at least after that storm UI did not downplay the amount of restoration work ahead of them. Your are right, it’s not UI’s fault we were slammed by such a crazy storm. And the crews are working very hard to restore power. But that doesn’t excuse the misinformation coming out of the company. This suggests there are more fundamental problems with how they manage not just communications, but storm restoration itself.